I have always loved different ethnic cuisine's. Over the years however recipes from the Mediterranean seem to really have become my favorites. I have always been enchanted with foods from Morocco and Persia, Greece and Italy. All of these easy print recipes are from trusted sources and some include helpful Cooks Tips. I 've learned over the years that these foods aren't particularly hard to cook, but preparation can take time. In years gone by some ingredients could be hard to find, but today a simple internet search will find you any exotic ingredient you need. As much as I love heavy creamy dishes, such as Fettucine Alfredo, I've learned that I'm much better off using spices and herbs to impart flavor, not fats. Along with my food being more healthy, I'm introducing my family and friends to wonderful new flavors and cultures. It's easy to incorporate this cooking in your everyday meals. 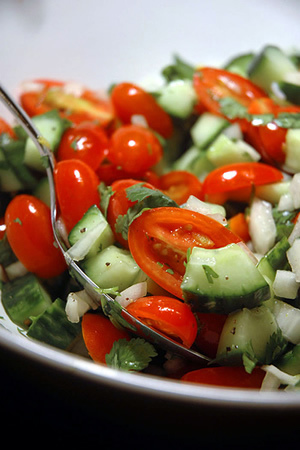 I'm becoming known for my flavorful and fresh Tabbouleh and Persian chicken kebabs at our cook-outs. So, since this site is about greenbeans n' more, I'm going to take advantage of the n' more to invite you to try these recipes with a Mediterranean flair. What is a Mezze? Click here to find out and to get a great sampling of recipes and ideas for hosting your own Middle-Eastern Mezze.